The Simotics HV C Motors are offered in vibration-optimized robust housing design and are suitable for safe areas and explosion protection zone 2. These motors are connected to the Sidrive IQ digital platform via Simotics Connect 600 connector box for cloud-based analysis of the condition data. The motors are used in pumps, fans, compressors, extruders, grinders and mixers. The units are offered with tubing cooling elements, cooling fins and modern fan design. The Simotics HV C air-cooled range from Siemens completes the Simotics HV C platform for compact high-voltage motors up to 3.2 megawatts (MW). The innovative cooling concept, involving a clever combination of fin and tube cooling, delivers improved temperature distribution in the motor, thus increasing the power density significantly. With their vibration-optimized, robust housing design, the Simotics HV C air-cooled motors score highly in terms of increased reliability. The new high-voltage motors feature an enclosed internal circulation (IC 411) and are equally suitable for use in areas where there is no danger of explosions (safe areas) and areas where explosions are not likely to occur (explosion protection zone 2) as well as being available in ignition-proof types Ex ec and Ex tc. The motors can be connected to the Sidrive IQ digital platform using the Simotics Connect 600 connector box: This provides access to cloud-based analysis of the condition data which allows the drive system to be optimized. The compact motors are used in pumps, fans, compressors, extruders, grinders, stirrers, mixers, conveyors and rollers in industries as diverse as energy, chemical, cement, paper and pulp, and mining. 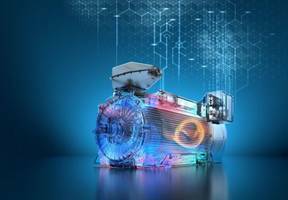 The increased performance density is based on the new cooling concept: Tube cooling elements, which have proven themselves over decades in the most demanding conditions, have been integrated by Siemens into the high-voltage motor’s rib-cooled housing. The motor cooling is improved by the addition of a modern fan design – unlike conventional methods, this reduces the internal temperature of the motor considerably. This provides a compact and light-weight motor design which increases performance by up to 15 percent and extends the operating life of components without changing the overall size. The highly flexible motor design allows it to be matched to customer interfaces on a project-by-project basis, for example, the connection leads can be located in many different positions. Due to a standardized design and management principle for compact, air-cooled motors with or without explosion protection, the cost is reduced across the whole lifecycle – from planning and procurement, through engineering and plant integration, to service, warehousing and spare parts management. Extended maintenance intervals and service times increase the availability of the drive system and thus the whole plant. Simotics HV C air-cooled motors from Siemens extend the range beyond the existing flameproof and water-jacket-cooled designs. Simotics HV C motors are an integral component of Sidrive IQ, the digital platform for optimizing drive systems. The Simotics HV C motors have an optional connectivity module for integration into the digital, cloud-based solution. This uses temperature and vibration sensors to capture and process data such as bearing temperatures, winding temperatures, and housing vibrations and transmits this information for analysis in the cloud. The connectivity module Simotics Connect 600 used on the Simotics HV C is specifically adapted to the requirements of Sidrive IQ. Sidrive IQ uses the data received to monitor, analyze and optimize the Simotics HV C motor drive: This increases the availability, efficiency and performance of the motors and improves service efficiency. As Simotics HV C motors are frequently used as part of the core process of a plant or system, connecting to Sidrive IQ increases the transparency of the drive system significantly, thus providing productivity gains for the whole system.